The board is more polarized over these uniforms than any set I can remember. I can see the argument about the Raiders and being simple, but I was hoping for a good combination of teal and gold and black. 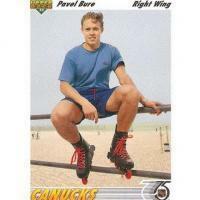 Because he was only suspended from practice and an exhibition game. That will leave him rested and fresh enough to take the Super Bowl this year. They also aren’t different either. I know we are splitting hairs but from the stands fans wouldn’t be able to tell them apart except for the TV numbers, and most are too ignorant to know they are a requirement. I can't wait to see how this discussion continues once the Jags wear their black jerseys instead of teal... won't be long now. I just do not like either of those designs because you can miss it on most players & it really adds nothing of visual interest to the jersey or pants. If the pants had some stripes that were at least teal & black I think these would look less like they are to be worn to practice and more like the other examples people keep using Raiders, Saints, Giants, etc. Just my opinion of course! I am sorry for offending anyone with the use of practice but c'mon we talkin' about practice, man! Yes, they are plain. Plain like a practice jersey because practice jerseys don't have bells and whistles. 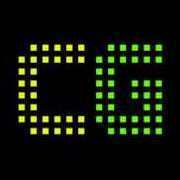 A lot of people like these because they don't like bells and whistles. People like Coughlin. What do you know, it was his job to accept and reject the final design. If simple equals practice jersey, then that isn't the insult you think it is. So yes, they resemble practice jerseys. Well, lots of people think that looks really nice. I do not know if I have ever seen a practice jersey worn in a stadium with lots of fans present before. Three words: Packers. Family. Night. To be fair, my comment was directed at the teal/white color combination -- not the details of the uniform. You won't find a bigger fan of the Fred Taylor set than me, and I would still have preferred if they'd gone back to it. You could argue that they have over-corrected a bit on these after going to the extreme with their last uniforms, but I'm okay with it. Simple isn't always a bad thing, and as traditional as it looks, the clean lines are actually quite contemporary. We've seen where trying to be cutting-edge has taken their identity over the past decade. We've also seen what Nike has done to teams who were trying to push the envelope -- our previous set, Tennessee, Tampa Bay, Cleveland, etc.... and no thanks. I don't see people getting sick of these after 2 seasons. People tend to get sick of the trendy, over-designed sets that look dated shortly after unveiling. If anything, I see this as the kind of set that could grow on people given that they choose the right combinations to wear. Again, it goes back to what I said was the misstep of sticking with the black primary. Being minimalist and clean is great, but not at the expense of your primary colors. Now was the time to switch back to teal as the primary set so that you wouldn't have this problem of needing to inject teal and gold into the look. My fear is that we'll consistently see black/white and black/black at home, with the white/black and white/white on the road. I'm still interested in seeing black/teal on the field, but I don't know how often they'll actually wear the teal pants. Exactly what's needed. The Jaguars need some gold accents and a pants stripe. Still keeps it plain and simple, but gives them a fleshed out look. Count me in with the current look being practice jerseys. The "details" are miniscule. The arm-cuff stripe gets lost in the pads, and the "collar spikes" are so minimal they might as well not be there. Then the logo patch is just tacked on (also, hey, look, it's on their practice jerseys). Then add the plain white pants, and completely ignoring the main color of the logo, and you have all the (or lack of) elements that add up to people scolding it as a practice jersey. And stop with the "WHUT ABOWT DA RAIDERZ?!" This is different and you all know it. Don't be obtuse. The uniforms are missing the color that makes their color scheme. I get what they were going for, but it's okay to have some color. The colors, and even the uniforms to an extent, weren't the main gripe everyone had with their last look. The issue was the dumbest looking helmet any team has ever made their players wear. 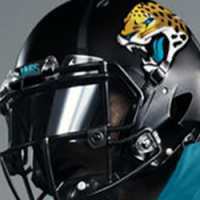 I'd have been satisfied if all they had done was given the team a normal all-black helmet on top of the Bortles unis. The new uniforms are better than the old uniforms, but they're also not as good as they could be because they stopped short in the name of simplicity and short of what we all know to be the correct solution - wear the damn 1999 uniforms and call it a day forever. The Jags teal jersey color is too light IMO to have white numbers without an outline. That just looks like the same ol' boring, clunky, typical design that we've been stuck with to the point we can't imagine uniforms without it. Same ol' blocky, pointless pants stripes. Same ol' cluttered number outlines. One outline, if any, is good enough. The new Jaguars uniform will change how we view football uniform designs. I do like the satin finish helmet in the first pic though. People comparing the Raiders’classic look with an underdesigned Jaguars uniform farted out by Nike are, indeed, being purposefully obtuse. This is either an amazing troll job or a terrible, terrible post. Design elements usually become “typical” because they work. Now that is a football uniform. Even though I'm sort of on the "practice jersey" side of the argument (I can see the merit the other side's argument, though), but this would be absolute perfection. Can’t speak for others, but I’ll admit I was doing it on purpose. Of course there’s no comparison to a classic that’s been the same since the 60s. My main issue is it seems like people are being lazy and just saying they look like practice uniforms. You don’t like it? Fine, I don’t care. That’s your opinion, but if you’re gonna criticize, at least give reasons behind it. You want more gold? Pant stripes? That’s fair, and both legitimate critiques. I’d just like the whole “THEY’RE PRACTICE UNIFORMS” to go away, because when you get down to it, a ton of classics are pretty plain like practice uniforms. Nothing is wrong with the Raiders being simply black with silver numbers. Just, for the love of God, can people stop calling the Jags set practice uniforms and thinking that’s a real critique? Same thing with the pants, tbh. The argument typically sounds like "Uh, where's the pants stripes? Pants are supposed to have stripes!" Are they? 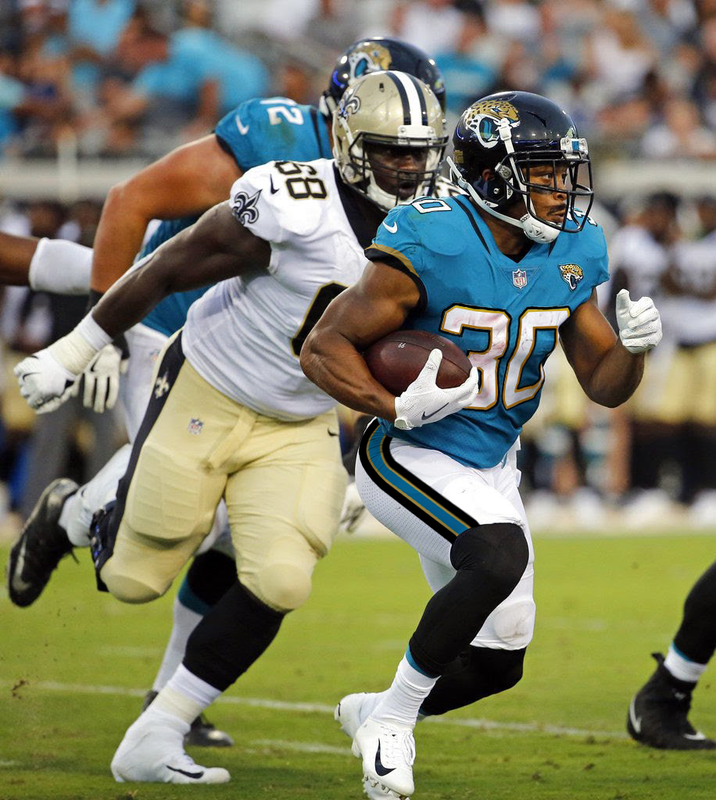 When I look at the pics with the Jags and Saints together, I realize how clunky the Saints look with those blocky, pointless, tacky looking stripes. The Jags look clean in comparison. From my perspective, the phrase "practice uniforms" doesn't just refer to the simplicity of the uniforms. It's a relative term comparing the new uniforms to the old ones. Like how practice jerseys are stripped down versions of a team's primary jerseys, the new Jacksonville uniforms seem like simplified versions of the previous ones. In both cases, colors other than the primary are removed, numbers are without strokes, and stripes and patches are at a minimum. This isn't necessarily a bad thing. Simple designs can be good, even great, but the context of the team matters. Jacksonville has a unique and modern color scheme, giving them potential for a striking look. These uniforms are a complete miss to me because they fall so far short of what could have been. 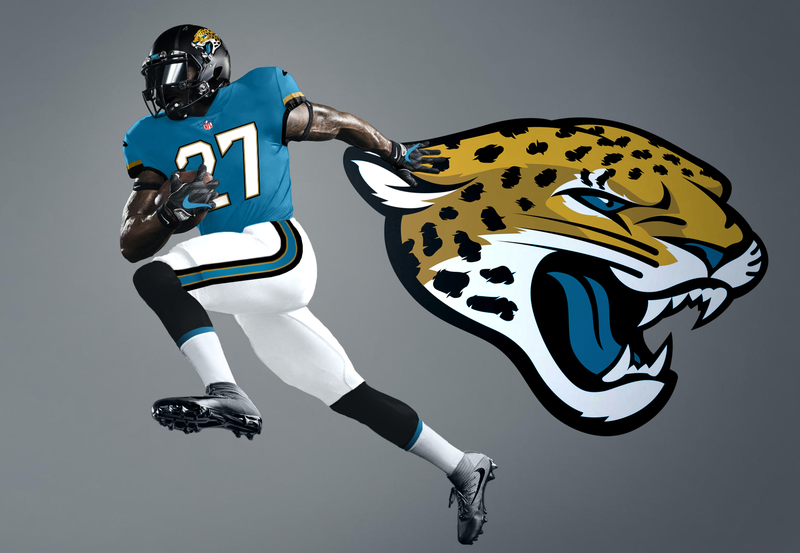 I think j'villejags absolutely nailed the combination between traditional and modern, fully fleshing out every color and creating a distinct brand identity.